Great show last night. Thanks to everyone who made it a great diecinueve de mayo party. Special thanks to No Substitutions. Awesome as always, and well worth $1,200. 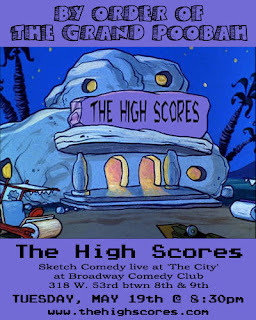 See The High Scores' next show at 8:30 on TUESDAY, JUNE 16th at 'The City' at Broadway Comedy Club. Set your time machines. Will be playing with us on Tuesday May 19th @ 8:30 at 'The City' at Broadway Comedy Club. So you're getting sketch AND improv. It won't be the best day of your life, but it'll be in the top 10. Next live gig is Tuesday, May 19th @ 8:30 at The City at Broadway Comedy Club: 318 W. 53rd (between 8th and 9th) . We'll announce our special guests soon, but mark your calender now. And not with a pen or pencil, make sure to use one of those sharpies.